A modern hotel with contemporary styling. All bedrooms were refurbished to a high standard in 2016, including: Pillow top mattress with premium bedding, 40 inch flat screen TV, Small fridge & microwave, Overhead rain showers with an additional hand shower and Complimentary WIFI access. 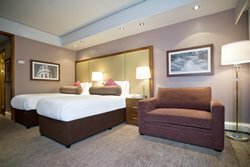 Hotel swimming pool and fitness suite refurbished 2017, Pool area, steam room, fitness suite and changing room. 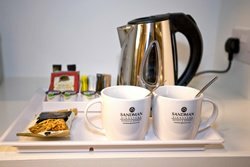 All rooms have en-suite walk-in shower room or bathroom, tea and coffee tray, satellite TV, phone, alarm clock, iron & ironing board, safe, fridge, microwave, hair dryer and free Wi-fi. £7.00 per vehicle per day on site. There is a restaurant with cosmopolitan menu and a lounge bar where snacks are available. The hotel is now moving forward to the second phase of the refurbishment program on all public areas - there may be disruption between the hours of 9-5pm. Naturally we will ensure any disruption will be kept to a minimum. Good stay room comfortable, swimming pool area could do with regular visits when we arrived no towels and had to go to reception to request more. Will definitely use this hotel again on our next trip abroad. This was our second visit to this hotel before flying. The room was excellent all round and excellent value for money. The service unfortunately was not excellent. We had been booked in by the arrivals team to arrive in 2019 not 2016. This took over 30 minutes to resolve and we were passed between three different people. After a four hour drive and arriving at 22.30 this was not a great experience. This will not put us off using this hotel again. 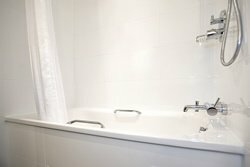 As I previously said, the room was furnished to a high standard with great beds and linen, quality bathroom and shower. The TV and air con were great. This should easily have been a 5 Star review. The booking process was quick and easy and the price excellent. I found the hotel to be just what we wanted - lovely room, clean tidy and well presented. Well appointed, pleasant, clean and tidy family room. Staff on reception helpful & friendly, including early morning alarm call. Airport taxi efficiently booked at reception the night before departure, at the hotel's fixed rate (Â£9) and was ready 10 minutes early in the morning. Can't comment on food as we left too early for breakfast. Would definitely use again. 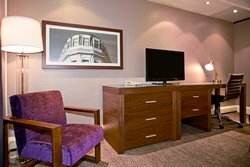 Excellent value deal on a family room .Nice hotel with free use of pool and 2 weeks parking .Hotel staff were friendly .Room was very nice .Only downside was the cost of food in the hotels restaurant and bar were expensive . Car park is quite small to offer airport parking, felt concern at leaving the car there. When we arrived the previous night, there were no car park spaces left, we had to move the car into a carpark space the next morning when a space became available. The Hotel itself was lovely and the staff very helpful. But I would not use this hotel for airport parking again. Overall we were left rather disappointed with our experience at the Sandeman.One of the reasons we picked this hotel was because it had a swimming pool.We were looking forward to visiting the pool after a long journey,unfortunately when we arrived we were informed that it was closed.A bit of prior notice would have been nice.The rest of the hotel was a bit tired looking and the bar was overpriced.Also our taxi to the airport, which was booked the previous evening turned up almost 15 mins late. The price you advertised the taxi to airport was not correct, some of the leisure facility's in the hotel did not work and the ones that did we're very poor! Very misleading very disappointed! Stayed beginning and end of our holiday. First might was horrendous. Air con did not work but they failed to inform us. Obviously windows don't open so stifling hot. Provided with fans but no option was given to move. On returning we were given room with working air con but room was supposed to be refurbishrefurbished, bunks where huge but rail was unsafe and mattresses had a six inch gap so very dangerous for young children. No plugs near a mirror and kettle had to be boiled on the floor! The hotel was easy to find and only a short taxi ride from the airport. The hotel was excellent and we would certainly book again. very good excellent service. I would use this hotel again when traveling from Gatwick. A very nice room and a good hotel , however we had a problem parking when we arrived , as it was full . We also asked for a wake up call , which we did not get , when I spoke to reception about this , it was said we can't guarantee a call . The call was for 3 am to catch a flight , we had our own alarm clock , but I felt it was a case of they couldn't be bothered . 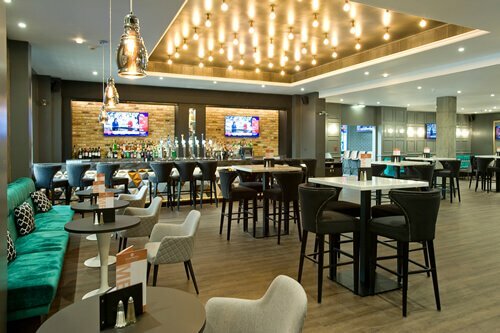 This is a great airport hotel and so convenient, just a 10 mins taxi ride from Gatwick. Booking through FHR was faultless and parking at the hotel was easy and secure. 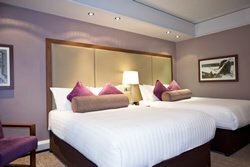 The room was large and comfortable and we enjoyed dinner in the restaurant with a 10% discount having booked through FHR. 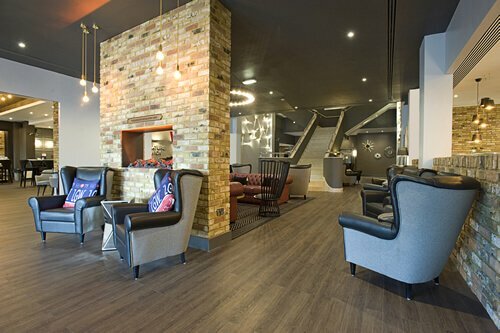 Despite not being located at the airport (which is reflected in the lower price), I'd definitely recommend this hotel and will not hesitate to stay there again when flying from LGW. Hotel was excellent and all of the staff were extremely helpful and polite. We stayed here the night before our flight from Gatwick. Nice room - clean & well appointed. Friendly helpful staff, nice breakfast buffet. I would recommend this to any family. Great hotel. Very helpful staff. Easy transfer to Gatwick. I would stay here again and recommend it to others. 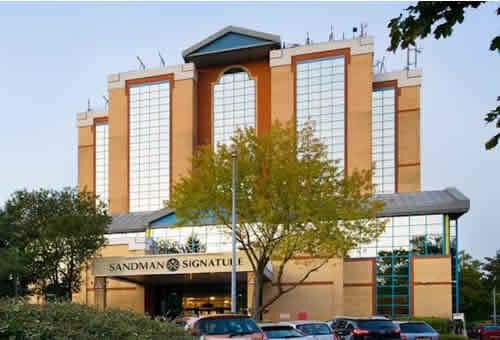 We were very impressed with our room, the parking & the excellent transport to & from the Sandman Signature arranged by the hotel. We will definitely use this service again. As before, the room was excellent, the bed comfortable etc. The restaurant provided a very good start to our holiday. The new arrangements for car parking with the car being brought to the airport on our return was an unexpected change from last year but excellent, we probably waited no more than 10 minutes for it to arrive. A great improvement on the buses and much appreciated. All bedrooms have been refurbished to a high standard completed in 2016, including: Pillow top mattress with premium bedding, 40 inch flat screen TV, Small fridge & microwave, Overhead rain showers with an additional hand shower and Complimentary WIFI access. 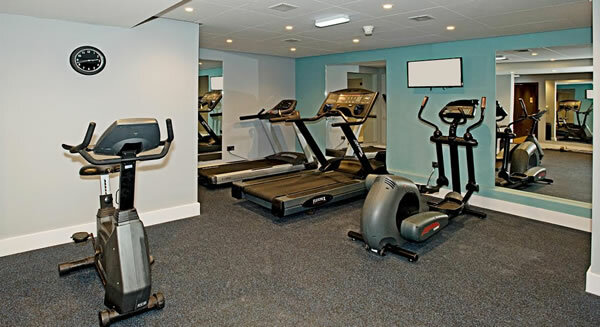 Hotel swimming pool and fitness suite refurbished 2017, Pool area, steam room, fitness suite and changing room. Rates do not include any airport transfers - You can book a standard taxi at the hotel for a fixed fee to either terminal at £8.50 each way (6 and 8 Seater MPV's are also bookable at a fixed price). If you have booked the standard parking package your car will usually be parked on site in the hotel car park, however at very busy times, at the hotels discretion, your car may be moved off site to Maple Manor Parking. please be advised that the restaurant and all food services will be suspended from the 24th December 12pm until the 26th December 12pm.